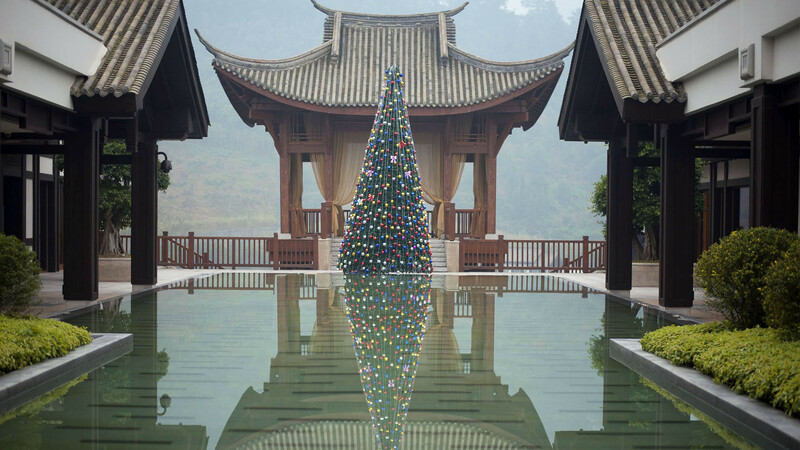 Banyan Tree Chongqing Bebei is a resort surrounded by the beauty of nature and the Jinyun mountains. The resort features an indoor pool, a fitness center and spa treatments. Guests can also enjoy the sauna, enjoy a spa treatment or make use of the meeting rooms and restaurant to sample Chinese specialties. All rooms have a terrace with private spa baths and stunning mountain views. It is in this context that Timber up-and-over doors have been installed that are well suited to the exotic and evocative style of the surrounding environment. This hotel is located near the Beibei Park and Motan Waterfall, a place of great interest. Relax in the full-service spa, which offers massages, body treatments and facials. If you're looking for recreational opportunities, you'll appreciate a hot spring, a health club, and an outdoor pool. In this striking setting, the up-and-over vertical Timber doors 85 were installed, with an internal steel structure - a guarantee of solidity and strength - externally clad with wooden panels, undeniable elegance. For this model, the multi-layer Okoumè panels are pantographed with thin vertical slats of 85 mm pitch. Staying at Banyan Tree Chongqing Beibei, you will be enveloped by the warm embrace of nature, thanks to lush vegetation and gentle and gentle mountains, here you will find a real sanctuary for your senses, the healing waters of the ancient thermal springs. Additional amenities at this property include complimentary wireless Internet access and concierge services. In addition to complimentary high-speed (wired) Internet access, a business center, and multilingual staff.